All files on this page and the following pages are created and are original works by Rex A Schildhouse. Joyce and I (Rex) both grew up in the Chicago area and never lived more than ten miles apart. We met at work and things just went from there. Fortunately for me. 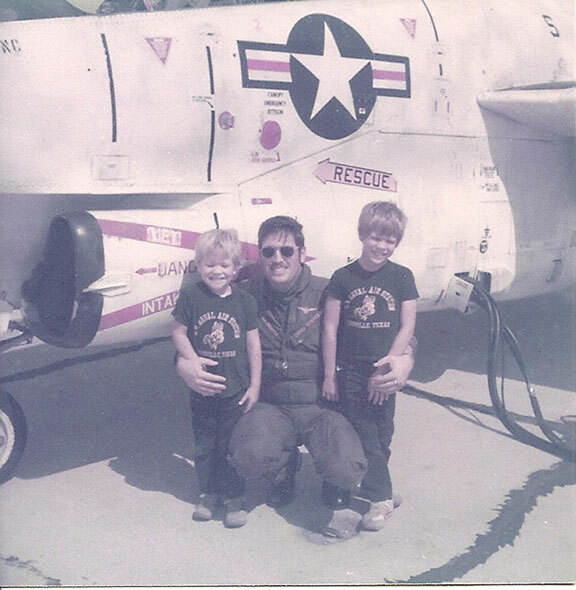 Due to an education and a career as a Naval Aviator we have lived in numerous cities and several foreign countries. And we have had the opportunity to tour several other countries. Our three daughters picked up our travels as they arrived in the family. Memories that will never die. Dates in (parenthesis) or without links have no entries. There are few times in life when you make it to "THE SHOW." Most baseball players are not picked by the majors out of high school or college. Most football players are not picked up out of college. You need a door you can walk through to enter the stage. My Wife, Joyce, and two of my Daughters work at The San Diego Zoo's Safari Park, formerly The Wild Animal Park. That opened a door one summer. The Zoo and Safari Park are operated by the San Diego Zoo Global and they were shooting a new commercial for the Roar & Snore Safari program where you get to sleep in the Safari Park overnight and take tours behind the scenes. My Sister, Kerrie, and her Husband, Brad, were in town for a visit and we all volunteered our time. Click here to see our commercial. Joyce and I are in the opening scene looking at a map on the bed in a premium tent. Kerrie and Brad appear while sitting in a premium tent talking by the light of a lantern. We all show up in quick clips, in the "big tent" scene, and in an animal presentation or two as well. This is one cool way to see the Safari Park. You will love it. Joyce and Cindi are guides for this program so you may meet them during your stay. If you take a weekend truck safari through the park Joyce or Cindi just may be your driver. They get to drive on the Plains of Africa on these tours. What a pleasure to work where you get to interact with animals in this type of environment. And you will find our pictures around the Safari Park in ads for Roar & Snore. Dad, William F Schildhouse, served in the Army and was stationed in Alaska and the Aleutians at the outbreak of WWII. He fought through the islands when the Japanese invaded them during the Battle of Midway. 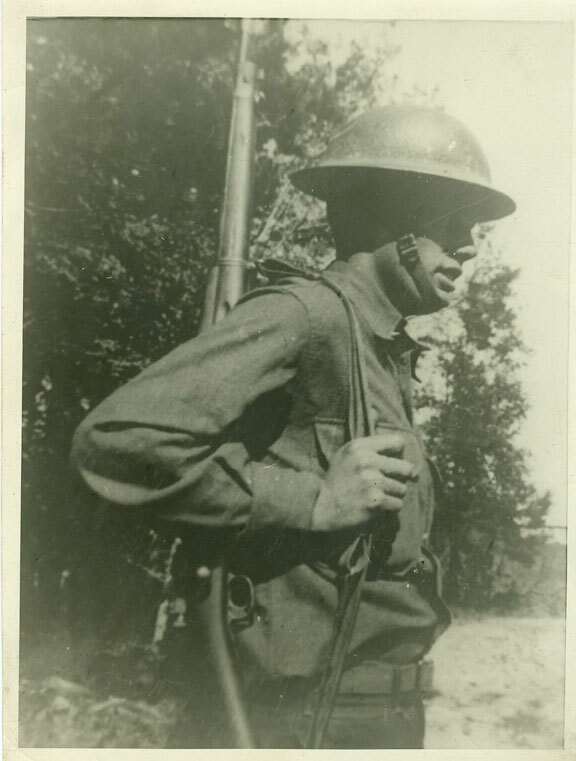 In this photo from his Alaska photo album he is standing guard equipped with a Springfield 1903. 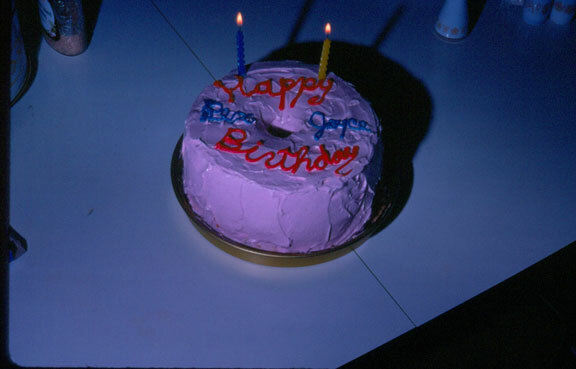 The date I assigned to this photo is in question (by me). I know what Dad said about his time in the Army. I requested a copy of his records from the National Archives and they were among those destroyed in the 1973 fire. 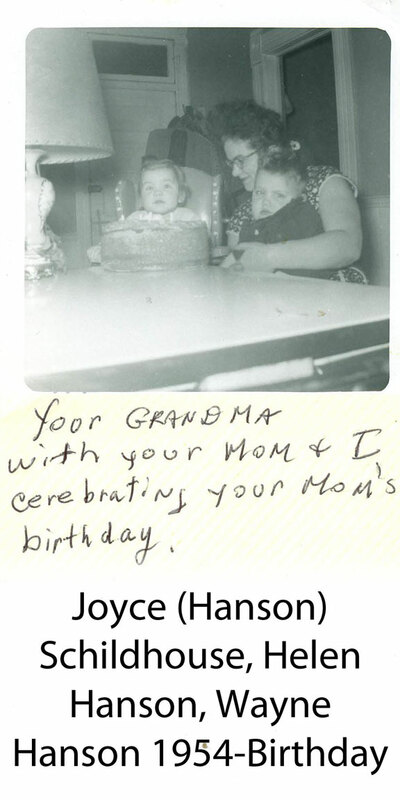 I have Dad's "final pay record" and that disagrees with photos such as this one and others that have dates and comments written on their backs. I have written to the 101st Airborne Association and the public affairs office for the 101st Airborne and have not received even an acknowledgement of the letters. These mysteries will never be solved. Dad, William (Bill) F Schildhouse is sixth from the left or second from the right in the back row. (Optimist or pessimist?) Wearing Corporal Strips. Most likely taken in Alaska. 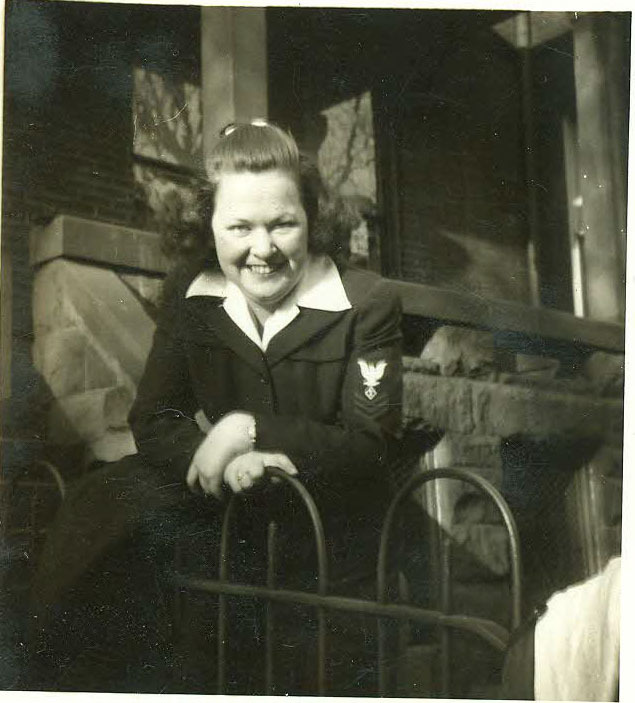 Mom, Carrie Jean Adams, later to become Mrs. William F Schildhouse, served in the WAVES (Women Accepted for Volunteer Emergency Service). We were fortunate enough to get a good copy of what appears to be a rather complete service record. In this photo, believed to be 1944, taken in Washington, D.C. were Mom was assigned to the Communications Station and the Naval Observatory. Interesting rate/rating badge on her sleeve, SP(I)1C. This is Specialist First Class, (Where the "I" is undefined), Punched card accounting machine operator and mechanic. 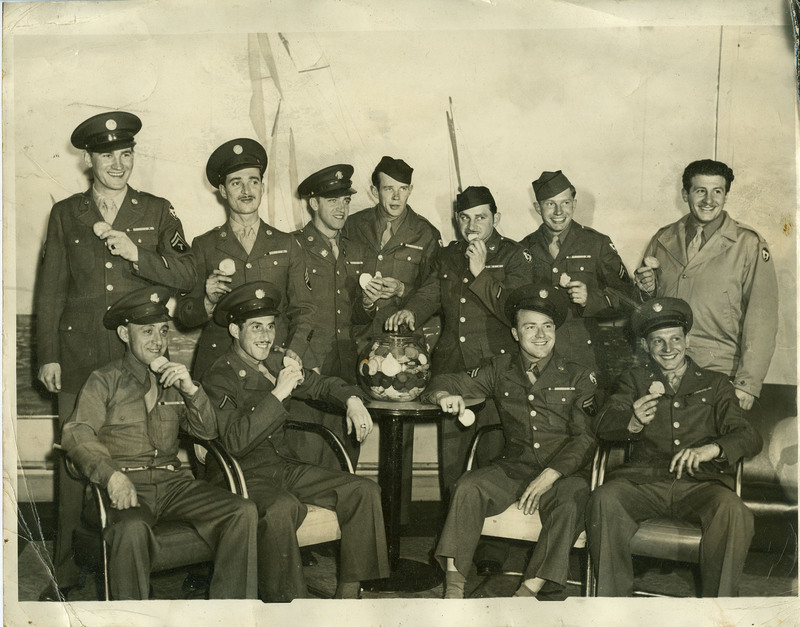 Mom has several unit commendations and letters for her organization's contribution to ending the war effort. Because of things she said, I assume that the "I" is related to intelligence over "input." This is the oldest picture I have of Joyce. Joyce, her brother Wayne, and her Mom Helen on Joyce's birthday. 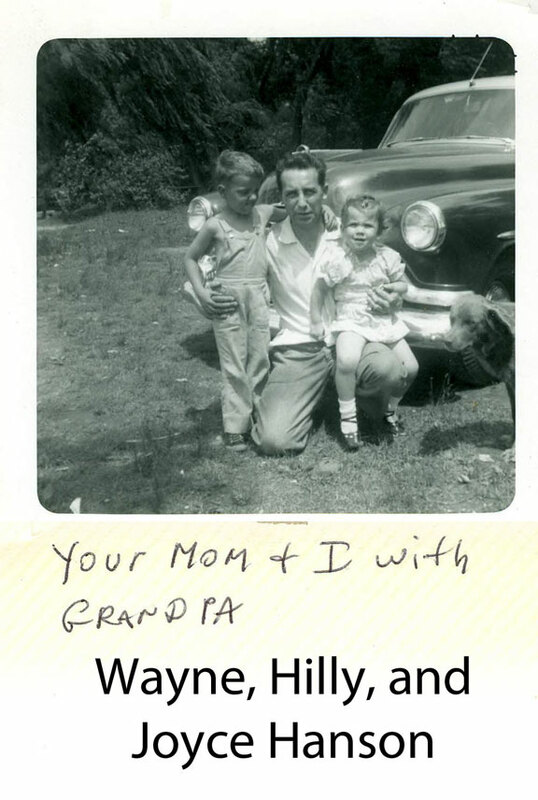 Going from left to right, Wayne, Hilly, (Joyce and Wayne's Dad) and Joyce. In front of the family Buick. The dog is unidentified. That is a 1951 Buick they are leaning on. 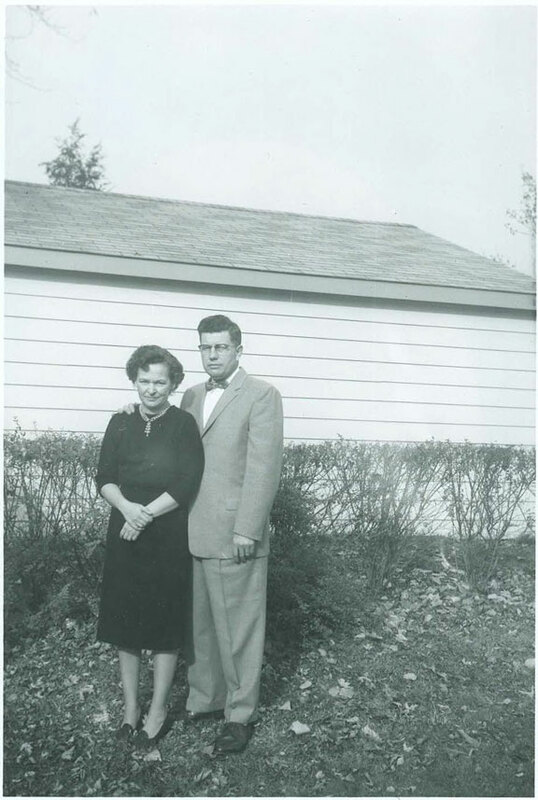 Mom, Carrie Jean (Adams)and Dad, William F. Schildhouse in our backyard in Chicago in 1963. 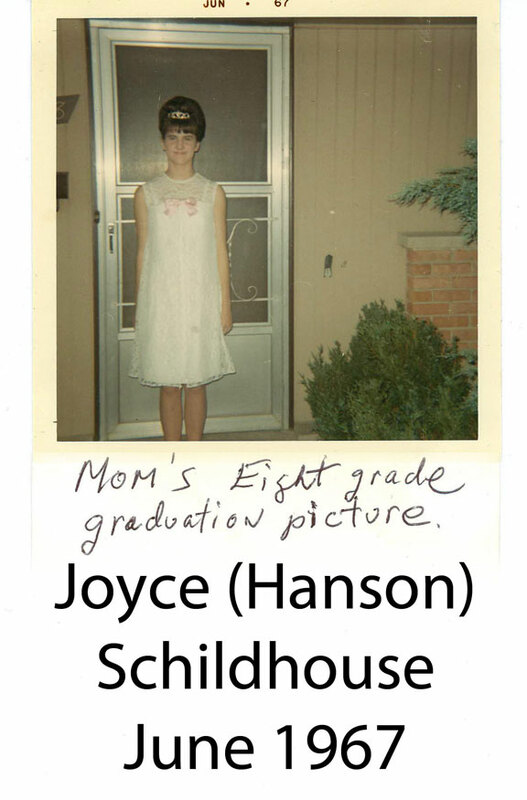 Joyce's eight grade graduation photo. 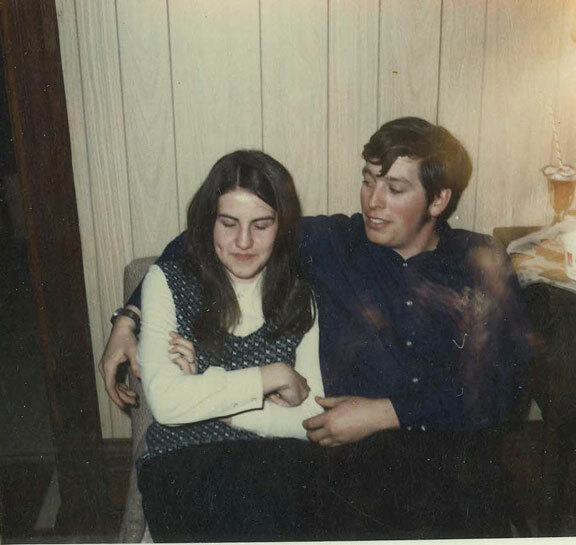 The first known picture of Joyce and myself together. I love those dimples. Joyce rolled me back on my heels with this dress. It has always been my favorite. I loved the color and the joy of the face wearing it. We had reservations at Kon-Tiki Ports in downtown Chicago and got there only to find a line of a hundred or so also with reservations and we were told it would be several hours. I think we ended up at Jack in the Box. 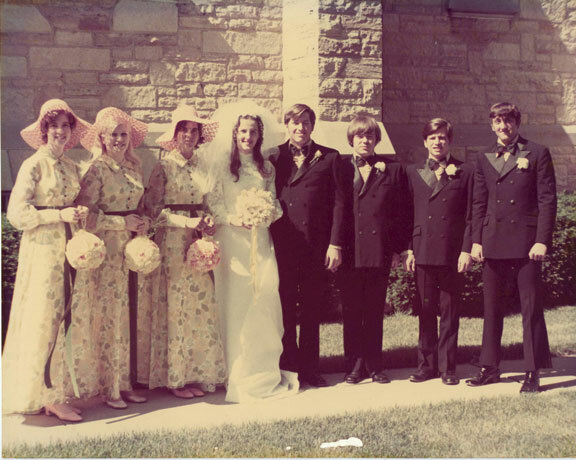 From left to right, Joyce's cousin Linda, my sister Jackie, Joyce's best friend Maryann, Joyce, myself, my best friend Jeff, my brother Bill, and Joyce's brother Wayne. 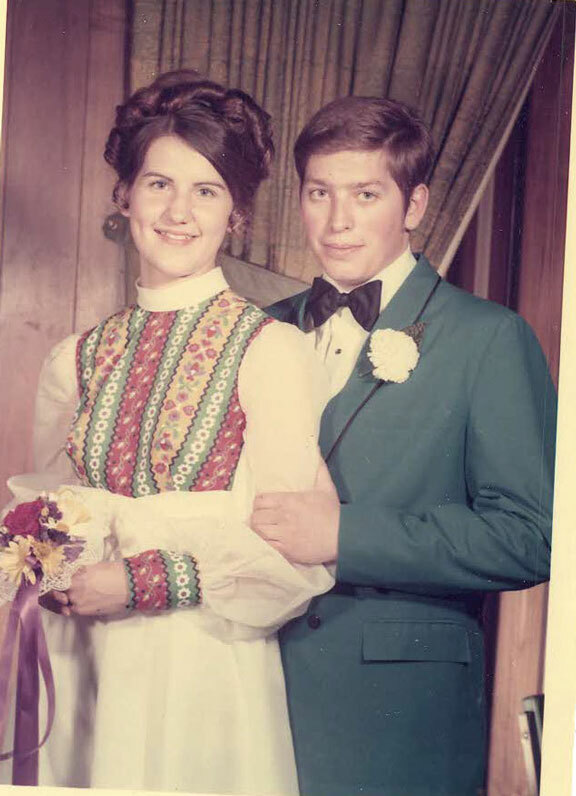 I would like to say I remember Joyce's dress that day. What I remember is her face. She never stopped smiling and she just glowed. It was a beautiful day. After the ceremony we went to Jardin's where we had a smorgasbord reception. At the end of that fantastic table was a huge bowl of chilled fresh strawberries that just never ran out. For our birthdays Jeff, my best man and friend since grammar school, helped me make a cake. Angel Food with Cherry Icing. We had vanilla ice cream with it. The things you remember because someone smiled. After the "house party" we strolled the main drags of Carbondale and had dinner, pizza, at Pagliai's Pizza. Pagliai's was the first place I remember with bottom soft drinks. While I was in college we had a two room apartment on campus. Actually a super place to be, Southern Hills Married Student Housing, Apartment 121-19. We were the end, ground floor unit. Big enough for company and small enough that it did not feel empty. Bill and Sherry got married in Pennsylvania so it was a trip. Kerrie and I both stood up for them. Kerrie and Brad's Wedding in Chicago. Maryann and Joe's Wedding, Joyce's best friend. 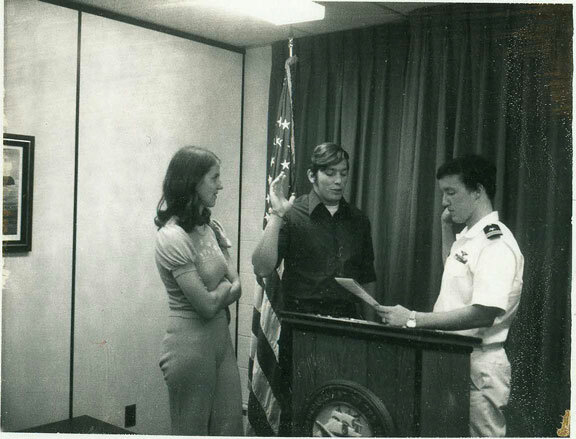 It was a joint decision so Joyce and I drove up to St. Louis, Missouri and swore into the United States Navy in the Federal Building. This is LT Keith McCormick, a Navy H-2 pilot, my recruiter. Kerrie and Joyce in a gun mount on the USS Alabama in Mobile, Alabama, 1975. Brad and Kerrie in front of a C-47 at the USS Alabama in Mobile, Alabama. Rex before his AOCS haircut on a gun mount at the USS Alabama in Mobile, Alabama. 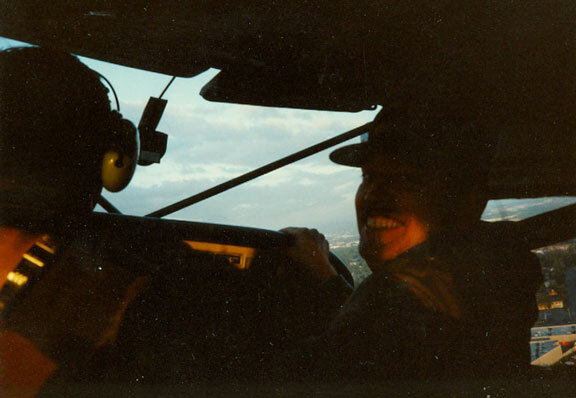 Rex as an Aviation Officer Candidate at Pensacola, Florida, 1975. Rex's graduation from Aviation Officer Candidate School in Pensacola, Florida, 1975. Dad putting Rex's Ensign shoulder boards on after commissioning. Without reservation, without Joyce I would not have completed flight training. Joyce learned the airplanes as well as I did and helped me practice all the ground activities associated with flight training. Joyce is standing in front of the North American T-28C Trojan. If you look closely you will see the tailhook of the "C." The other cue is the wide, shorter prop blade. This was taken at Naval Air Station Corpus Christi, Texas, with Training Squadron (VT) 27. Mom and Dad could not reschedule their vacation for my winging ceremony, which was changed at the last minute for carrier qualifications. So Mom's cousin, Colonel Marvin Adams, United States Air Force, Retired, visited with his wife. Captain Colvin handed the Wings of Gold to Marvin who handed them to Joyce. And Joyce pinned them on. Joyce had bought these Wings earlier and I marked them so I know which ones they are. Without Joyce this day would most likely not have happened. Flight training is more of a mental game than a physical game and I needed her help for the mental side of the game. Joyce on the Star of India at the San Diego Maritime Museum. This is the last steel hulked sailing ship still sailing, 1976. Joyce getting kissed at Lion Country Safari in Orange County, California, 1976. 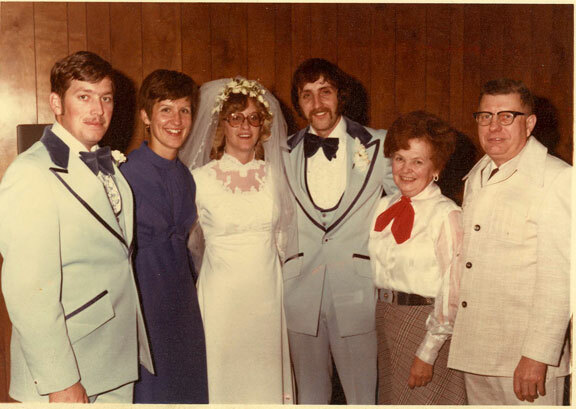 Wayne and Debbie's wedding. 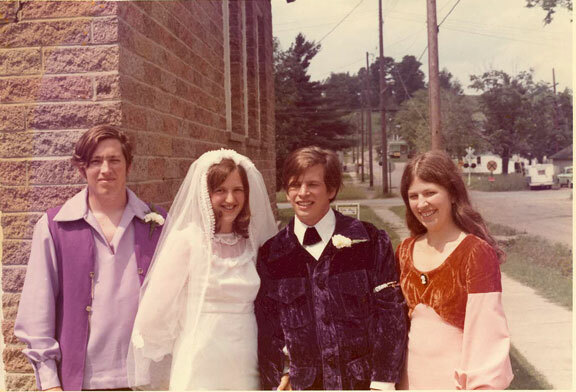 From left to right, myself, Joyce, Debbie, Wayne (Joyce's brother), my Mom, and my Dad. Joyce talking to a mermaid at Marineland of the Pacific in Orange County, California, 1976. Joyce checking out some flowers at the Grand Canyon, Arizona, 1977. Our 1975 Ford F-250 Supercab parked at the Grand Canyon, Arizona, 1977. Joyce checking out a Ponderosa Pine at the Grand Canyon, Arizona. The Ponderosa Pine has a distinctive and pleasant scent. Rex as we enter the Oak Creek Canyon area of central Arizona, 1977. Just one of hundreds of sunset photos we have. 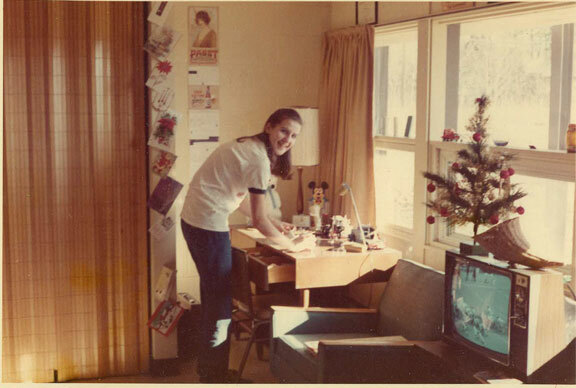 Joyce in front of our house in the U.S. Navy housing area Negishi Heights in Yokohama, Japan, 1977. Joyce's trip to the Philippines, 1977. Joyce in front of the USS Midway on her trip to the Philippines, 1977. Joyce, Rex, and Crackers in front of our house in Negishi, Japan during the big snow, 1978. A Japanese train schedule. The top row is hours, the columns are minutes in those hours. The color is the type of train, red is express, black is local, 1978. Joyce at some temple or garden entrance somewhere in Kyoto, Japan, 1978. Joyce at the Bell Temple in Kyoto, Japan, 1978. Joyce feeding some new friends in Japan, 1978. Joyce and Rex at some temple in Kyoto, Japan, 1978. Rex at the grave site of navigator William Adams in Nagasaki, Japan. William Adams lived the late 1500s and early 1600s in western Japan, 1978. Most likely not a relative. Tyrannosaur Rex at the Sapporo, Japan Snow Festival, taken by Joyce, 1978. Joyce at another Japanese temple or garden, 1978. Joyce at the entrance to the Ueno Zoo in Tokyo, Japan, 1978. Joyce outside the Ueno Aquarium, Tokyo, Japan, 1978. Mom and Kerrie at a park in Tokyo, Japan, 1978. Mom and Kerrie at a Baskin-Robins in Yokosuka, Japan, 1978. Mom and Kerrie at a real Japanese restaurant, 1978. Joyce with Cindi who is one day old in this photo, Yokosuka, Japan, 1978. Mom, Cindi, Joyce, and Kerrie in front of our house in Yokosuka, Japan, 1978. Cindi, Joyce, Rex, and Mom in front of our house in Yokosuka, Japan, 1978. Cindi working a cookie in Yokosuka, Japan, 1979. Joyce and Cindi in front of a Japanese restaurant, 1979. Japanese restaurants and shops will put plastic displays of their food in the windows to show their product. Cindi is off to visit a McDonald's in Yokosuka, Japan, 1979. Joyce and Cindi make a new friend at the Tacoma, Washington Zoo, 1980. Cindi and Dad decide to duck out on the Tacoma, Washington visit for a minute, 1980. Joyce, Cindi, and Mom on the waterfront of Seattle, Washington, 1980. Mom, Joyce, Cindi, and Aunt Maribelle in profile, atop the Seattle Space Needle with Space Needle Sundaes, 1980. Rex, Cindi, Jenni, and Joyce in our Christmas card from Kingsville, Texas, 1981. 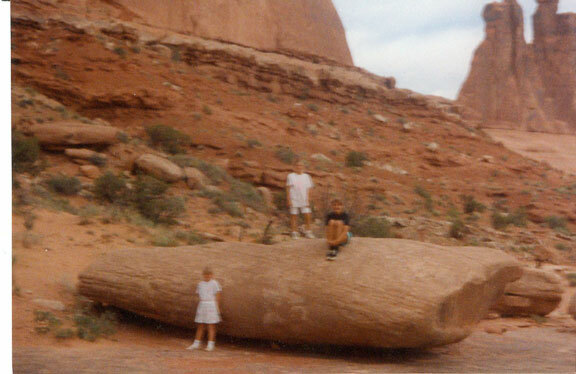 Nephew Justin, Rex, and Nephew Jason in front of North American T-2C Buckeye, 1981. Rex as an instructor flying formation in a North American T-2C Buckeye, Naval Air Station Kingsville, 1981. Rex in Chicago outside Morgan Park Presbyterian Church. I was standing there talking, a dove landed near me, I put out my finger and he hopped on. He stayed for ten minutes or so, 1981. I think this is our last picture of Grandma (Elizabeth) Adams. 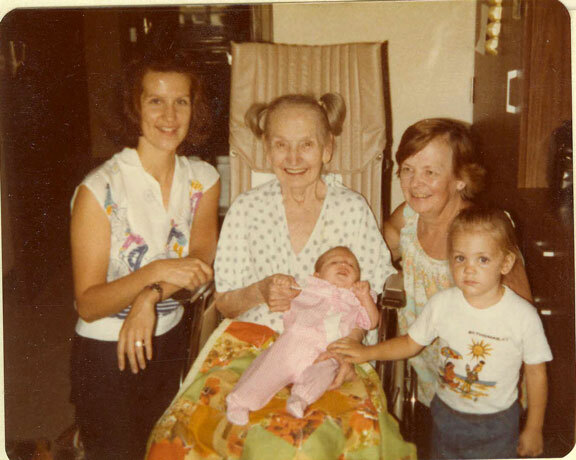 Left to right it is Joyce, Great/Grandma Adams holding Jenni, Mom (Carrie Jean [Adams] Schildhouse, and Cindi. I was supposed to fly into Chicago for Jenni's Christening at Morgan Park Presbyterian Church and the airplane went down so the flight got cancelled. 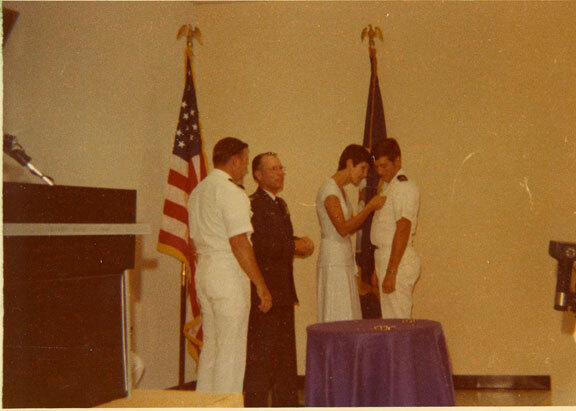 Rex getting an award from the North American rep and CDR Sulfaro, Kingsville, Texas, 1982. Family photo, Rex, Becki, Jenni, Cindi, Joyce, JayJay the Beagle, and Crackers the Cat outside our home on Naval Base Yokosuka, Japan, 1984. Becki asleep in the stroller, Jenni, the neighbor Becky, and Cindi sitting on a traffic rail in Yokosuka, Japan, 1984. Joyce all dressed up for a party during her trip to Hong Kong in 1984. Midway's Grumman C-1A Trader with CDR Jones and Rex on the last flight of a carrier based C-1A in the U.S. Navy. On a cold, rain April 4, 1985, we flew from NAF Atsugi, Japan to NAF Kisarazu, Japan in about thirty minutes and an era which started in 1952 came to a quiet end, 1985. USS Midway in a dry dock at Naval Station Yokosuka, Japan, built to construct Japanese battleships in the 1930s. This is hull damage from an unknown contact while at sea, 1985. The rudders and props of the USS Midway while in dry dock in Yokosuka, Japan, 1985. 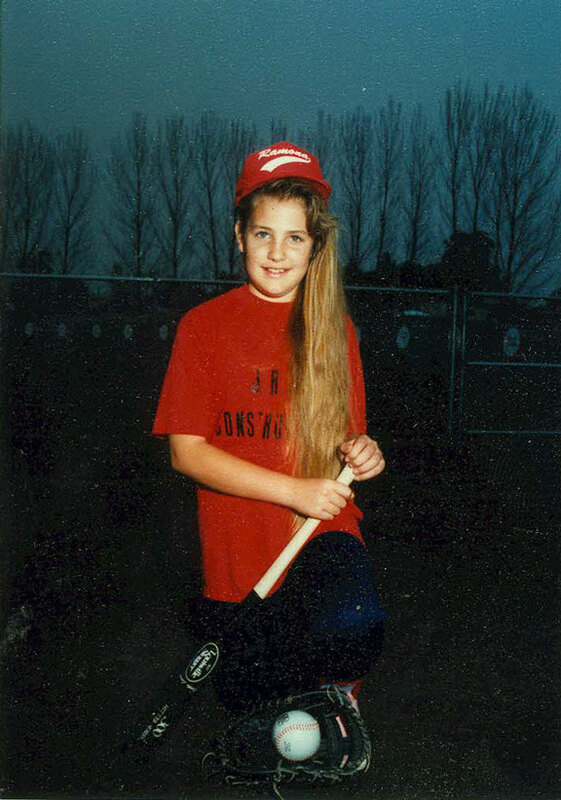 Jenni at school in Woodbridge, Virginia, 1985. Cindi, Jenni, and Becki at Jenni's school in Woodbridge, Virginia, 1985. Halloween for Becki, Cindi, and Jenni in Woodbridge, Virginia, 1985. Jenni coming at the camera on her trike. Becki with the long ponytail on the other side going away, Woodbridge, Virginia, 1986. Our white Dodge Caravan and estate sided Dodge Aspen are in the background, 1986. Becki on her trike in Woodbridge, Virginia, 1986. Cindi proving the relationship of static electricity and losing a tooth in Woodbridge, Virginia, 1986. Cindi at that point in life, Woodbridge, Virginia, 1986. Halloween for Cindi, Joyce, Becki, and Jenni in Woodbridge, Virginia, 1986. Jenni pretty happy that she found something that crawls or wiggles. Normal for Jenni. Becki, in the background, wants no part of it, 1986. Becki has always had her own, personal touch to add, Woodbridge, Virginia, 1986. Santa with Cindi and Becki in Woodbridge, Virginia. The little girl between them is a neighbor, 1986. Jenni, Cindi, and Mom at the Lincoln Memorial in Washington, D.C., 1986. Jenni also has her own personality, Williamsburg, Virginia, 1986. Sarah (cousin), Cindi, Jenni, Matthew (cousin), Jason (cousin), and Becki during our Colorado vacation in 1986. Photo of a Grumman E-2C Hawkeye landing on the USS Nimitz, 1989. When the USS Nimitz (CVN-68) with Carrier Air Wing 9 and VAW-112 onboard made a port call in Anchorage, Alaska I had duty the first day in port. I turned on my amateur radio and contacted the hams on the beach. I hosted about fifteen for a tour of the ship. Bob, AL6KS, one of the group ran me around Anchorage for several days and took my flying in a float plane. The local currency was the U.S. Dollar, they spoke English, and drove on the right side of the road. Super port call. We stopped at Arches National Park in Utah on a way through. What a site. From left to right this is Becki, Jenni, and Cindi just taking a break. A lot of walking and some wonderful scenery. Well worth the stop. Bring water on the walk. A Grumman C-2A Greyhound landing at Cubi Point, Republic of Philippines, 1990. The girls all played baseball for awhile. I think this photo is from 1990 when Cindi was a member of the Wildthings. The girls all grew up with long hair. During one of the games one of the girls rounded second base and her ponytail flashed in front of the second base girl. The second base girl was no part of any play at the moment but the official, a fan of the other team, called the daughter out for interference. The girls were active in 4-H for years. I walked into the VFW Hall and found a card on the wall with a horse for sale, all tack and pipe corrals included. After the vet looked at her, Balladrona, better known as Ballad, she came home. 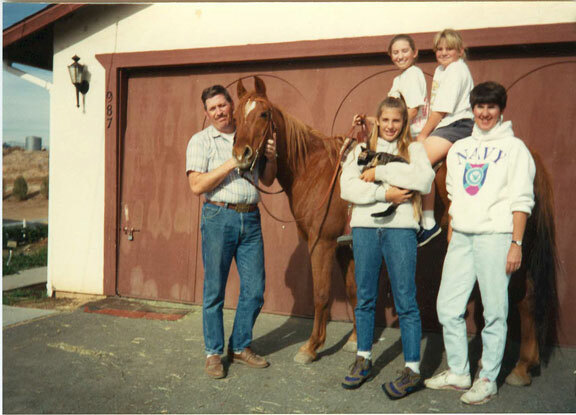 A registered Arabian about ten years old and a fantastic horse for the kids. She loved being ridden and was a very mild mannered horse. The girls took lessons for awhile. We kept her for about six years until other interests took over the girls attention. 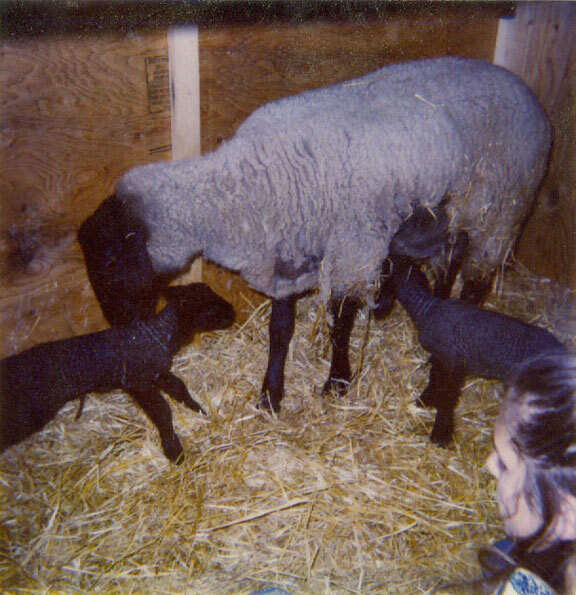 As part of the girls 4-H program we bred sheep for several years with probably 90% being successful. Here is a ewe with her two lambs probably within hours of birth. Cindi is just watching to make sure. 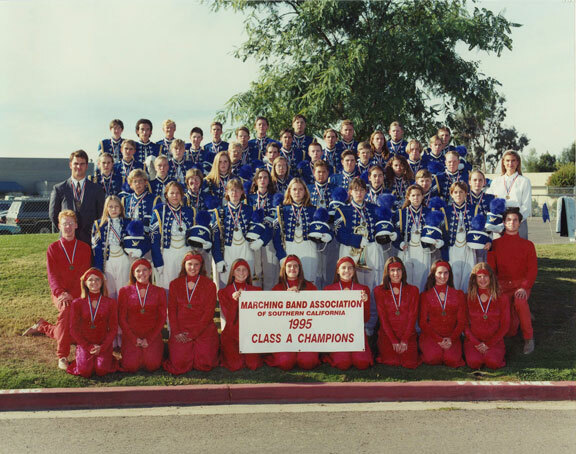 Cindi and Jenni were in Color Guard with the Ramona High School Band at the same time. Cindi was captain most of the time, when she graduated Jenni took over cocaptain with another member of the team. As you look at it, Jenni is holding the left corner of the banner and Cindi is holding the right corner. Cindi's graduation from Ramona High School. 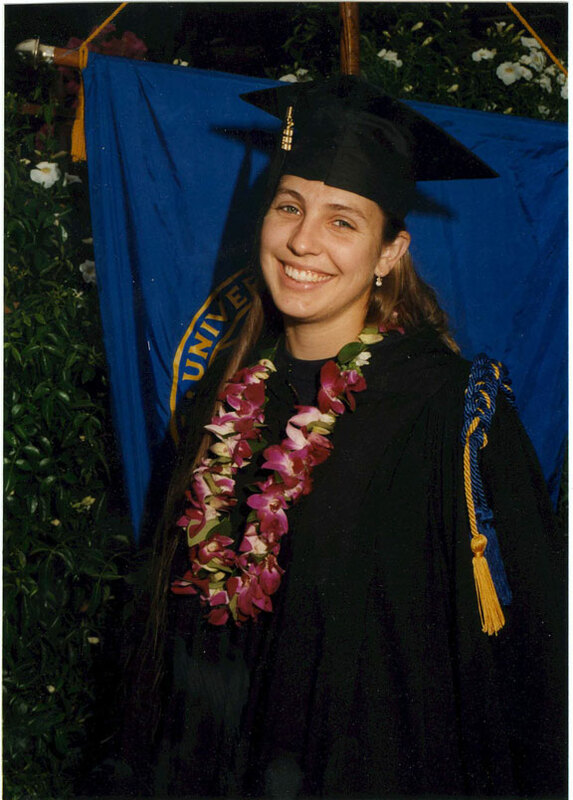 Cindi's graduation with honors from University of California, Santa Barbara. A beautiful school right on the edge of the Pacific. 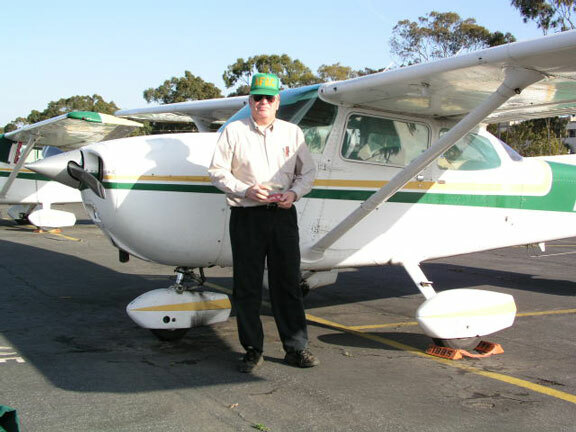 Rex in front of Cessna 172 Skyhawk of Armed Forces Aero Club (AFAC) at Montgomery Field, San Diego, 2004. 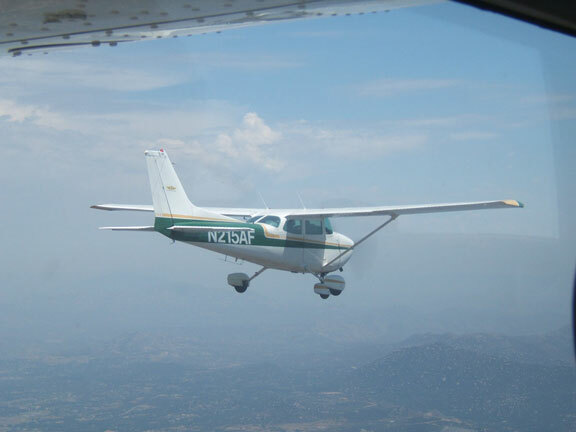 Flying formation on a Cessna 172 Skyhawk from Armed Forces Aero Club (AFAC) over southern California, 2005. Joyce in front of Naval Air Facility China Lake, California's museum. The planes are a Douglas TA-4 Skyhawk and a Grumman A-6E Intruder, 2006. Airborne over southern California, 2006. Joyce at the March AFB museum by a B-47 Stratojet engine assembly, 2007. Joyce at the welcome to Disneyland display, 2007. Rex, a horse, and a coach woman at Disneyland, 2007. This is my kind of corn!!! California Adventure, a Disney park, 2007. Here are a series of fire shots for different fires. We live in a fire prone area and have a minor fire at least six times a year and a major fire once a year. This fire is just north of Ramona burning west on the Santa Ana Winds, 2007. We are driving out of town in the smoke and haze created by a major fire, 2007. The Witch Fire of 2007 burned through our property. The house was protected by four sprinklers on the roof. The landscaping was not. The bank was destroyed by massive water flows from helo drops up the road and rains after the fire with no ground cover to slow them down. I love operating heavy equipment, 2008. Ramona Visitor - Mr. Toad. He is about five inches in diameter, 2008. Here is one of the MANY sunset pictures we have from our property in Ramona, 2009. While we were in East Sacramento, California, we found a BIG cup of Coca-Cola waiting for us. Cindi was thirsty, 2009. Cindi and Morgan at the California Highway Patrol Academy upon Morgan's graduation. No get of jail free card, 2009. Elli was born October 25, 2003. It just so happens that this is the same day the Cedar Fire broke out. The Cedar Fire burned over 430 square MILES. Elli lived through every fire since, 2009. Ramona Visitor - Mr. Gopher Snake, this one is about six feet long, 2009. We love these guys and to watch them work is amazing. They stick their heads in a hole and smell. Then either pull out and check another or go down that hole FAST. If they find a gopher that does not get away they eat it and are "stuck" in the hole until the lump dissolves so they can move out, 2009. Ramona Visitor - Mr. Tarantula. This guy is about 4-5 inches across. They do not bite or sting so picking them up carefully is not a problem. They can hop and startle you. We let them live for what they kill and eat, 2009. Ramona skies. We are placed between the Pacific Ocean and the desert used in Star Wars for Luke's home plant of Tatooine. And we have coastal plains to our west and mountains to our east. We get all sorts of interesting clouds and weather, 2009. The La Brea (Spanish for tar pit) Tar Pits are about two hours north of our house. So ... we went. There are no dinosaurs there as the pits are much newer than that age. But Joyce and I were there so just maybe..., 2009. We toured Petco Park, the home of the Padres. Pretty cool to be sitting in the press boxes for a journalism student, Becki, and her Mom, Joyce, 2009. Becki is cluing in the catcher on how to handle the next batter, 2009. Becki was accepted at Indiana University for her master's in journalism. She is happy, 2009. Becki is getting her master's degree in journalism at Indiana University, 2010. Becki is at the Indianapolis Zoo proving she is a tourist, 2010. Becki is trying for the pole position of the Indy 500, 2010. Joyce is wondering where the clutch is at the Indy 500 Museum, 2010. Rex is wondering why they let him in at the Indy 500 Museum, 2010. Becki at the the Great American Ball Park Museum, home of the Cincinnati Reds to watch them bet the Chicago Cubs BADLY, 2010. Joyce high fiving Johnny Bench at the the Great American Ball Park Museum. That day the Cincinnati Reds bet the Chicago Cubs BADLY, 2010. 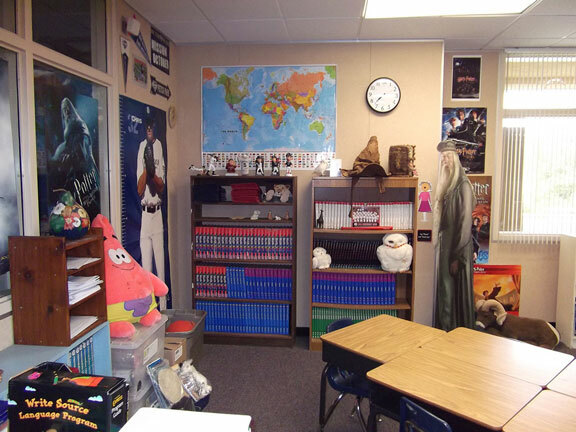 Joyce's classroom is a setting of Hogwarts and Padres, 2010. I think this picture of Joyce and Jenni was taken at Yanks Air Museum in Chino, California, in 2010. Rex and Jenni in front of a North American T-2C Buckeye at Planes of Fame Air Museum in Chino, California. Rex used to fly the T-2C as an instructor at Naval Air Station Kingsville, Texas, in the early 1980. This jet is just fun to fly and land aboard an aircraft carrier, 2010. Jenni taking advantage of shade at Planes of Fame Air Museum in Chino, California, 2010. Daughter Cindi is leading a tour into the CRES Center - Conservation and Research for Endangered Species Center - of the San Diego Zoo's Wild Animal Park / Safari Park, 2010. Joyce at the San Diego Zoo's Wild Animal Park / Safari Park holding the hand puppet used to feed the California Condor chicks so they do not become attached to humans, 2010. When the San Diego Zoo's Wild Animal Park / Safari Park makes advertising it asks for help. In the lower pictures you can find Rex, Joyce, Kerrie (Sister) and Brad (Brother-in-Law) in a starring role, 2010. We love visiting zoos and animal parks. Joyce is talking to a former student at the San Diego Zoo, 2010. Joyce talking to one of her slower students at the San Diego Zoo, 2010. Part 1 of 2, We occasionally get beautiful rainbows. This one was over the house, 2011. Part 2 of 2, We occasionally get beautiful rainbows. This one was over the house. Becki spotted it first and spent a while watching it, 2011. We love visiting zoos and animal parks. Joyce is talking to a future student at the San Diego Zoo, 2010. Joyce talking to one of her slower students at the San Diego Zoo, 2012. It does not freeze very often on our property and it seldom snows on us. Hail is another matter. Elli found out what snow is, 2011. Joyce enjoying our infrequent snow fall. Normally for snow we jus drive thirty miles east into the mountains at 4,000 - 7,000 feet, 2011. The next morning as it was melting off, 2011. Just another view of Ramona skies, 2011. From Becki's first on air clip with KNBC San Diego as a sports broadcaster, 2012. Becki is in the spotlight on KNBC San Diego's Sports Wrap, 2012. Cindi ran the gauntlet. 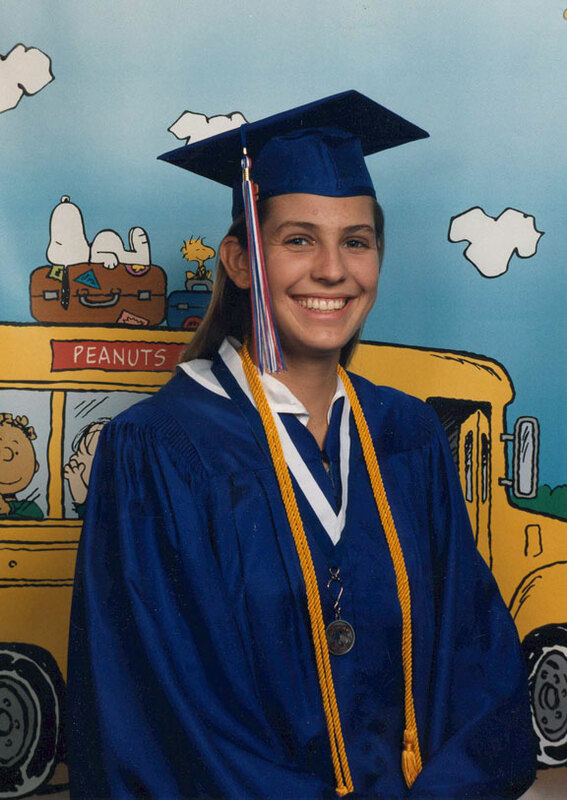 She was school and district Teacher of the Year. The Encinitas Chamber of Commerce had a SUPER ceremony, 2012. Cindi at the Petco Park Teacher of the Year ceremony, 2012. Sign for Cindi at the Petco Park Teacher of the Year ceremony, 2012. Jenni and Brian at their wedding. Jenni and Brian wanted it to have a Margaritaville atmosphere, 2012. Elli the Puppy just watching, 2012. Jenni and Brian's dog Weatherby, 2012. Joyce at the San Diego Air and Space Museum. This is a complete rocket motor and control nozzle, just add fuel, 2012. The San Diego Air and Space Museum is in a building built by Ford Motor Company for the Panama-California Exposition in 1935 time frame. In the center Ford inserted a symbol as it introduced a new engine, the V-8. the center fountain in the lower circle of the 8, the upper circle is just past it, the left side of the V is clear, the right side is behind the pillar, 2012. Joyce is checking the time with Marty McFly (Michael J. Fox) next to a stainless steel 1981 DeLorean DMC-12 at the San Diego Auto Museum, 2012. I told Joyce I would buy her a new car but the DeLorean was not an option. She is checking out an option at the San Diego Auto Museum, 2012. I found Joyce's new car at the San Diego Auto Museum, 2012. Joyce at SeaWorld of San Diego. This shark's jaw is prehistoric so do not expect to find one this week in the ocean, 2012. 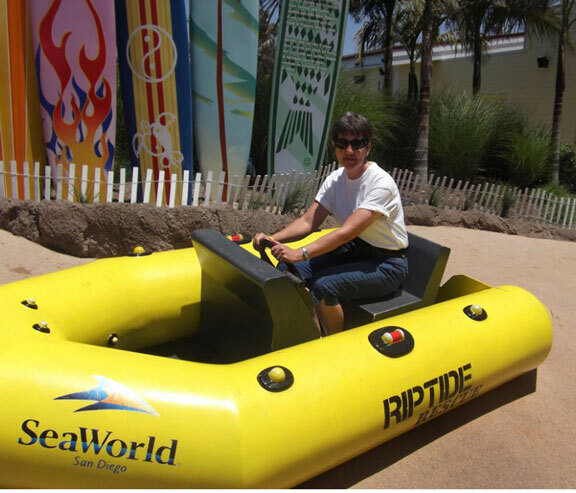 I bought Joyce a boat at SeaWorld of San Diego to go with her new car, 2012. Joyce in one of the many learning exhibits at the Chula Vista Nature Center, 2012. We visited the ASARCO Mine Museum just outside Tucson, Arizona. 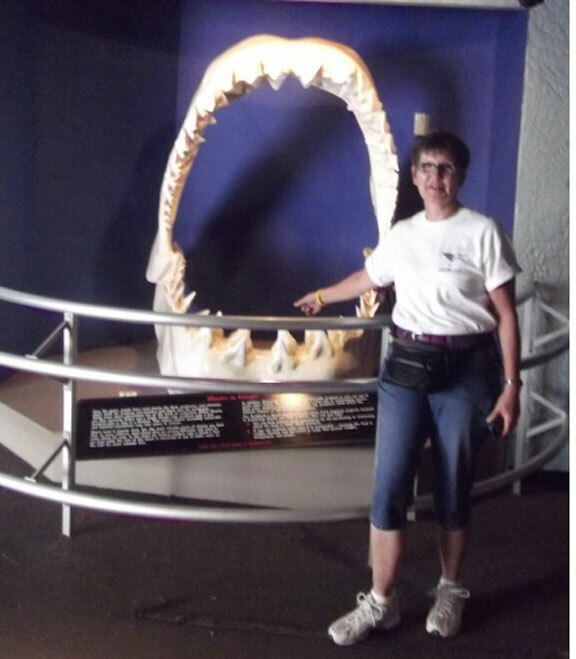 Joyce is standing by a tooth from one of their digging machines, 2012. We were in Tucson, Arizona, in July 2012. Joyce got to hold a rainbow while we were on Davis-Monthan Air Force Base, 2012. Joyce at the Reid Zoo in Tucson, Arizona, 2012. In the Sonora Desert Museum Joyce grew some ears to ear her students' whispers at 100 feet, 2012. Just south of Tucson, Arizona, is the Titan Missile Museum. This is the viewing cover so you can see the missile housed in the silo, 2012. Thomas Jefferson, Joyce, Amy, and Patrick Henry at a reception for Joyce's upcoming trip to Williamsburg, Virginia for American History, 2012. Patrick Henry and Rex are having a debate at a reception for Joyce's upcoming trip to Williamsburg, Virginia for American History, 2012. Ramona Visitor - Mr. Redtailed Hawk. We have many desert and mountain animals in the neighborhood, 2013. Ramona Visitor - Mr. Rattlesnake. This baby diamondback is about 14" long and still deadly to many, 2013. Ramona Visitor - Mr. Roadrunner. 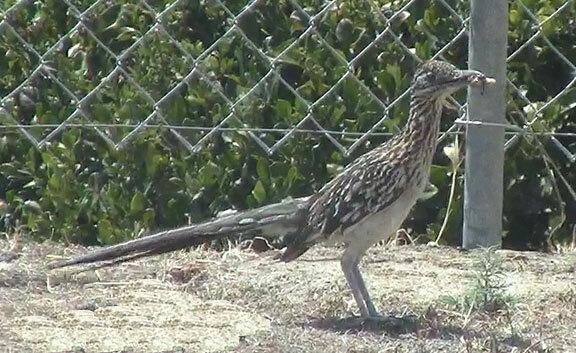 This roadrunner has a lizard in its mouth and is simply looking for a place to have lunch, 2013. Albert Hammond sang a song I named my third daughter after - Rebecca. He also sang a song everyone seems to know called "It Never Rains in Southern California." It really does, weather was actually not the gist of the song. And the wind blows. We get Santa Ana Winds, named after Generalissimo Santa Anna who went through what would become the state of California "Like the fire on the wind" when the state was fighting for its independence. When they came up with enough money they simply bought his interest out. Santa Ana Winds come from the east and one of the requirements is a high pressure area over the four corners area - the only place in the U.S. where four states meet - Utah, Colorado, Arizona, and New Mexico. With its clockwise rotation we get powerful winds from the east through Southern and Central California. Often pushing wildland fires into the tens of thousands of acres. 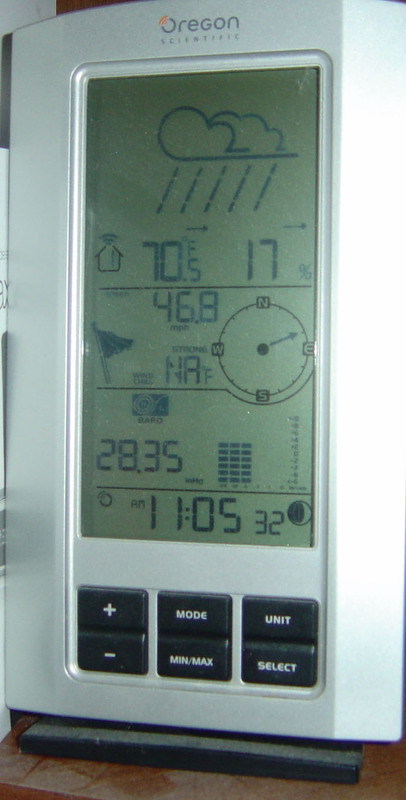 Our little weather station has an anemometer that goes to 99.9 miles per hour. On one of our wind storms / wildland fires we left the property and upon return it showed 99.9 MPH. The roof took a hit but we still had a house. Around 4:30 AM, Sunday, January 25, 2015, something cracked in the house to the point I woke up. I got out of bed around 7:30 AM and looked at the weather station. It read 61.8 MPH as peak gust at 4:36 AM. The picture did not turn out due to glare from the overhead lights. Still blowing pretty hard, I reset it and got this one at around 10:30 AM, only 46.8 MPH. Reset it and got 37.4 MPH around 11:15 AM. The temp was only 70.5 degrees with a relative humidity of 17% at 11:05 AM on January 25, 2015. 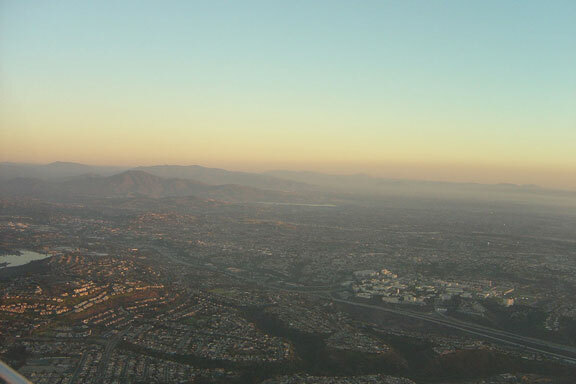 Santa Anas are normally dry winds. And, because when air compresses it get warmer, for once the coast is usually warmer than the inland areas. We live at about 1,635 feet above sea level. To say California blows is true. We do get rain and we get a lot of mud slides. Later in the day on Sunday, January 25, 2015, our weather changed. Very interesting clouds as the systems collided. San Diego County is a fun county for weather. We have coastal, mountain, desert and convergent or transitional regions. Plus, we have two significant ridge lines, one to our east running north and south and one to our north running east and west. Both ridges contain peaks in excess of 6,000 feet. This forms a catch basin or shield, depending on tons of variables. The town of Ramona, our town, is about 25 miles northeast of downtown San Diego. We are at about 1,600 feet above sea level and encircled by ridge lines up to and exceeding 1,000 feet above the floor of the valley. This valley effect goes both ways. Sometimes weather systems go around us or over us while other times weather systems get caught in our valley and dissipate on us. We can watch the rain in downtown San Diego on the television and not even see a cloud in our skies. Or, downtown San Diego wants to know how we can have rain while they do not even see a cloud. San Diego County / Southern California has two major influences from the Pacific. El Nino (little boy) is a period when the Pacific tropical region gets warmer than average. Two out of three El Nino cycles will be “wet” and give us above average rainfall for the region. La Nina (little girl) is a period when the Pacific tropical region is cooler than average. Two out of three La Nina cycles will be “dry” and give us below average rainfall for the region. We are leaving a La Nina cycle that lasted for four dry years – drought years for Southern California and MAY BE entering an El Nino cycle. Half of the years are average sea temperature – neither El Nino nor La Nina. We have lived in Ramona since the Thanksgiving weekend of 1987 on this “tour.” It is my / our third “tour” into San Diego County’s military complex. For years, I documented the weather fairly well and watched it with interest. The average rain on our property is 9-11 inches annually falling from mid-late November into early March with an occasional rain in August. In the winter of 1987-1988 we got 22 inches of rain from mid-November into late March. It was called a “Once every 100 year winter” by the locals. Ramona is so prepared and ready for heavy rains that we do not even have storm / drainage sewers. That is what we have fields and road for. The 2014-2015 winter was one of the driest and warmest on record. We normally get 90%+ of our rain during the winter and we got less than 40%. We usually get nothing in April and had the wettest April in almost 100 years in 2015 with over three inches of rain. Prior to 2015 the Padres have had one game rained out at Petco Park, back in April 2004. The Padres have had rain delayed games. The Padres game was called for rain on Sunday, July 19, 2015. Beach events such as sand castle competitions and “over the line” contests which have run for 30+ or 60+ years without a problem were called for the weather. In July 2015 Tropical Storm Delores formed in the tropics of the eastern Pacific. Delores had several choices – travel north over the cool, descending coastal current and die, go to the east and hit Arizona and New Mexico after passing over Mexico. This is Arizona and New Mexico’s monsoon season. Or, she could move west and find heat and fuel. Delores decided to move north over the descending cool coast current into Southern California. This should have killed her rather quickly and raised the humidity of San Diego County and maybe given us some low-mid range clouds. Delores came north, over the cool, descending coastal waters and SLAMMED San Diego County over the weekend of July 17-19, 2015. If you research San Diego County rainfall for this period you will find a wide variation in the accumulations due to topography. When you research even the valley of Ramona you will find variations due to placements within the valley. I am talking about my property unless otherwise stated. Friday night, July 17, 2015, into Saturday morning, July 18, 2015, we had thunderstorms move through the valley of Ramona. We do not get a lot of thunderstorms. Accumulation was less than one quarter inch. All cell activity, intense for three-five minutes. Then quiet again. On Saturday morning, July 18, 2015, with the radar showing orange cells moving in I put a straight-sided bucket in the yard. It rained here Saturday afternoon and we got just over one and a half inches from probably four or five cells moving through the area. Downtown San Diego had drizzle. During the Padres game, 5:10 PM first pitch, we had a few drops in the fifth or sixth inning. Did not even slow the game down. On Sunday, July 19, 2015, the radar showed quite a few orange and red cells moving through the area. Around 2:00 PM, the intermittent drizzle and occasional rumble of thunder changed and the sky simply opened up. It poured for more than three hours. Just after it started I emptied my “accumulation bucket” - my electronic rain gauge gave up a couple of years ago due to dust, so I missed the first half hour or so. At about 7:30 PM I had 3 and a half inches of water in the bucket. It was still raining, although lightly. We have been on our property for more than 27 years and have never seen water flowing as a torrent where it was flowing Sunday, July 19, 2015. I was working in the yard for six hours trying to minimize the damage and at times had water up to my knees trying to knock me over. (I was tangled up in an auto accident in May 2013, and have limited use of my right arm and this event almost killed me as I tried to fight it and lost! Thank God for Dragoon Naturally Speaking voice to text.) The patio / car park for my hot rod may occasionally get a bit muddy in heavy rains. It has 4-6 inches of mud on it. This mud is decomposed granite (“DG”) and water. It is heavy and sticky. When shoveled it simply will not come off the shovel. Neighbor’s fences that have been up for twenty-five plus years are down / gone. Sheds that have been in place during Santa Ana windstorms in excess of fifty miles per hour and wildland fires for twenty plus years are moved and down. Propane tanks that have been on spot for almost thirty years are laying on their sides five feet from their original spot. Statistically we will have thunderstorms every three or four years. We had over 500 recorded lightning strikes just on Sunday, July 19, 2015. In July we are normally (fifteen years ago) in the 105+ temperature range at less than 15 percent relative humidity. Today we are 78 degrees at 10:30 AM and 65 percent. Look at the rest of the contiguous forty-eight states this winter, (2014-2015), spring, and summer (2015). Is it hotter or colder? Is the weather following a normal trend or is it totally ballistic? Has man influenced the weather? Without a doubt. However, weather always changes because of Mother Nature. Do we call it Mother Nature because she is unpredictable and call it Father Time because it so consistent? Interesting issue to argue. Remember, due to the drought we have been advised to let our ground cover die to conserve water. Now we are being criticized for not having ground cover in place to hold the soil (DG) in place. This is our workshop. It is four inches above terrain. The water is two inches above the bottoms of the overhead doors. 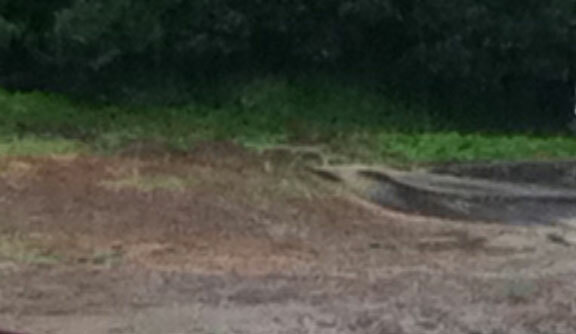 There is a swale (drainage ditch) behind the El Camino that is 24 inches wide and 12 inches deep. It could not handle the water so the water is flowing across the front of the workshop to another swale behind the workshop. This is the swale (drainage ditch) next to the workshop. Basically 24 inches wide and 12 inches deep. However, ice plant, branches, rocks, DG (decomposed granite) was clogging it up. This is where I spent a lot of time keeping clogs down. The water is getting its run across the front of the workshop in front of the power panel, in the lower left corner of the photo, and at the top of the workshop parking pad. It was a wave front. This is our driveway. The "tan" stream is about twelve feet wide and 4-6 inches deep in the middle, designed to move water. Our neighbor has easement rights for a driveway. The river coming down that driveway is covering completely an eleven foot wide blacktop driveway. All flowing into my swale trying to pass the side of my workshop. The neighbor's yards and the road into our driveway also dump into my swale. Part of owning property lower than those above you. There are neighbors who live below me. That is where the water makes its way. Sorry, not a great photo. This is a wave front carrying tons of DG with it leaving my swale and starting across my workshop parking pad. This first video is from our garage looking down our driveway into our street. Our neighbor has an easement across the corner of our property. The day started out with intermittent rain and drizzle, then, around 2:00 PM, the sky just opened up. It rained like this for more than three hours before it started - STARTED to ease up. We still had light showers at 7:30 PM. The straight-sided bucket I put out at about 2:30 PM had three plus inches at 7:00 PM when I took it in. This second video is of our "front yard." The swale (drainage ditch) there runs parallel to our property line and is 6-8 inches deep. The water running down it is coming out five or more feet in spots as it runs down and behind the workshop. The overflow from the other swale joins it. This water was running faster than I could walk.